One of the most common musculoskeletal complaints of patients seeking medical advice is shoulder pain, with shoulder impingement syndrome being the most commonly diagnosed shoulder disorder. Modern advances in anatomy, biomechanics, and research have gone some way in improving the understanding of impingement syndrome but despite this, it is still a debated topic. Typically, patients present with rotator cuff tendinopathy. The rotator cuff tendons are contained in the subacromial space. 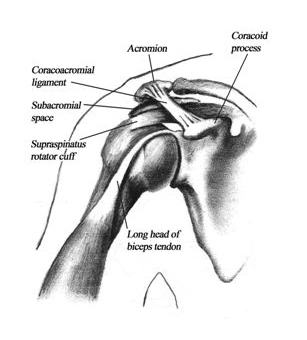 The superior boundary of the subacromial space is formed by the acromion and the coracoacromial ligament (Fig. 1). The superior boundary of the subacromial space has to move superiorly for the humerus to elevate during arm elevation. Should this not occur, compression on the upper side of the rotator cuff tendon can occurs. The inferior subacromial space is defined by the humeral head and superior shoulder joint (Fig. 1). Impingement syndrome, involving the rotator cuff tendons, can be divided into two broad groups defined according to anatomical side of the tendon being impinged upon, and by the pathomechanics involved. These two broad groups are referred to as subacromial impingement syndrome and internal impingement syndrome. In subacromial impingement the proposed pathomechanical process is that mechanical compression occurs to the superior side of the soft tissues in the subacromial space. In internal impingement syndrome, the inferior side of the rotator cuff tendon becomes jammed in the shoulder joint. This is commonly seen in athletes who do a lot of throwing (Fig. 2.). There is controversy with regard to the exact causes of shoulder impingement syndromes. Possibly, factors are multifactorial. Pathological factors that are considered to contribute to impingement syndrome can be divided into intrinsic and extrinsic categories. Intrinsic factors are those associated with factors from within the rotator cuff tendons themselves and extrinsic factors are considered to be those that compress the rotator cuff tendon from outside of the tendon. Fig. 2. Internal impingement: the tendon of the rotator cuff becomes jammed within the superior shoulder joint. Intrinsic factors that contribute to rotator cuff tendon degeneration due to tensile/shear/overload include: alterations in biology, mechanical properties, morphology, and vascularity within the tendon. A continuum theorem of tendon pathology is proposed in which the tendon intrinsic properties response to demand. The continuum defines the under loaded to the over loaded tendon with the normal tendon in-between the two extremes of the continuum. Too little demand causes tendon degeneration due to lack of exposure to tensile loads. But the intrinsic response to demand within the tendon requires a period of adaptation to histologically respond favourably. Based on current evidence, the hypothesis that a reduction in subacromial space is an extrinsic cause of impingement syndromes is not conclusively established. But maintenance of the subacromial space is important in impingement syndromes regardless of whether it is a cause or consequence. Treatment aimed at addressing mechanical factors appears to be beneficial for patients with impingement syndrome but not for all patients. In reality, it is unlikely that only intrinsic or extrinsic factors are responsible for impingement syndrome. It is more likely that a combination of the two contribute to impingement syndrome and that, the longer the syndrome is present, both intrinsic and extrinsic causes become meshed and provocative of each other. Mackenzie TA, Herrington L, Horlsey I, Cools A.